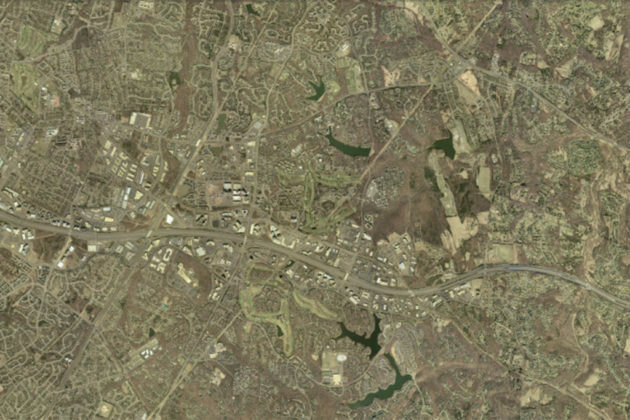 For the final Reston Then and Now — a series where we’ve used Fairfax County’s aerial photography to track changes in the area — we’re looking at the area overall and at how far it’s come since its founding. 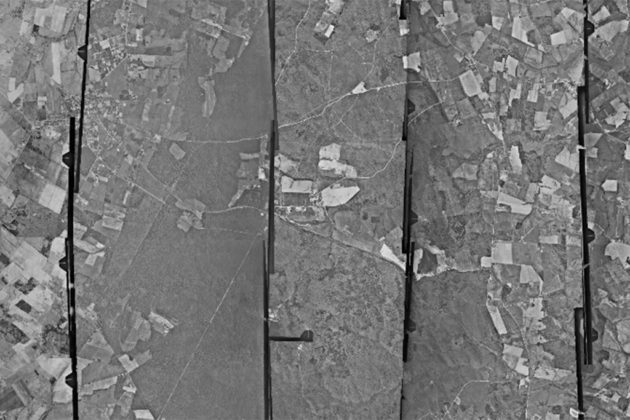 Reston was founded in 1964, but some of the paths that are roads today — like Baron Cameron Avenue — are still visible in photography from 1937. 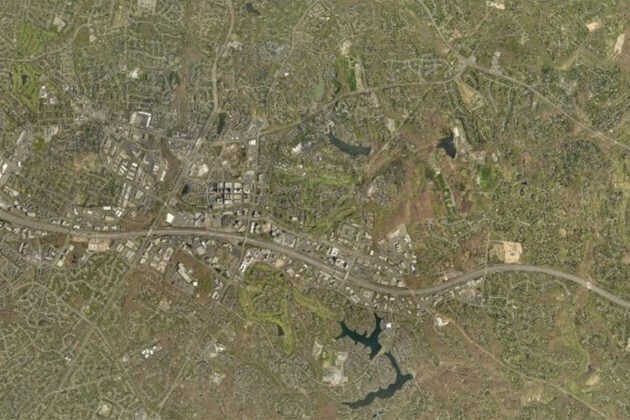 Reston’s iconic man-made lakes are also absent, leaving most of the area that’s Reston today just open fields. By 1976 though — 10 years after Reston was founded — the region was starting to take shape in the neighborhoods around Lake Anne and Lake Thoreau. 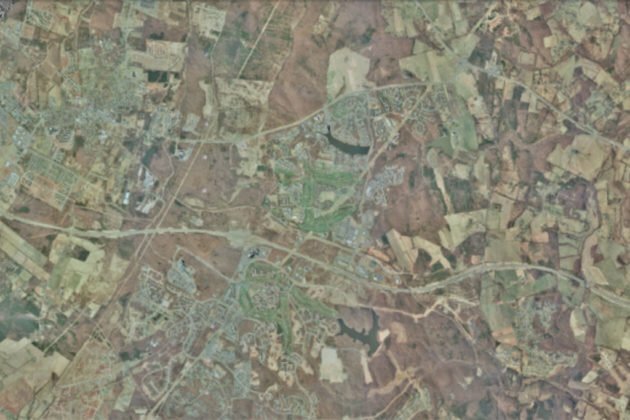 The village design envisioned by founder Robert E. Simon is still apparent in those early aerial photographs showing retail and residential areas clumped together. 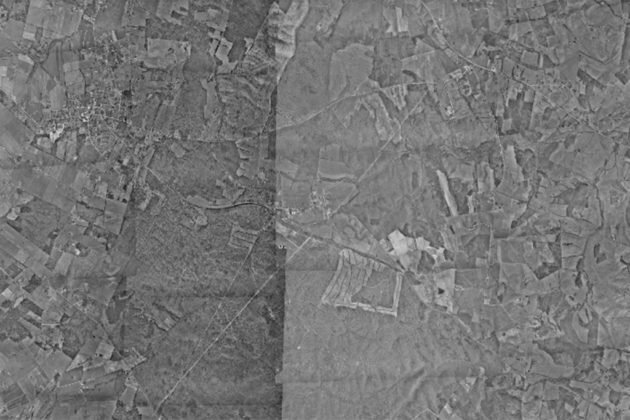 But over the years, those isolated communities start to become increasingly interconnected to the point of being almost indistinguishable from above. 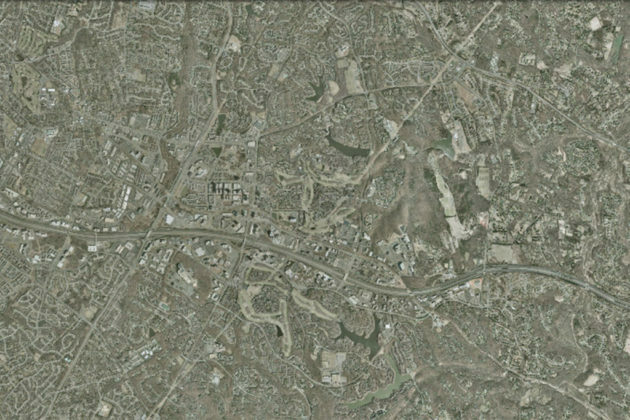 By the mid-1990s, the only major patch of green space around Reston is Colvin Run near Lake Fairfax and southeast of Lake Anne. 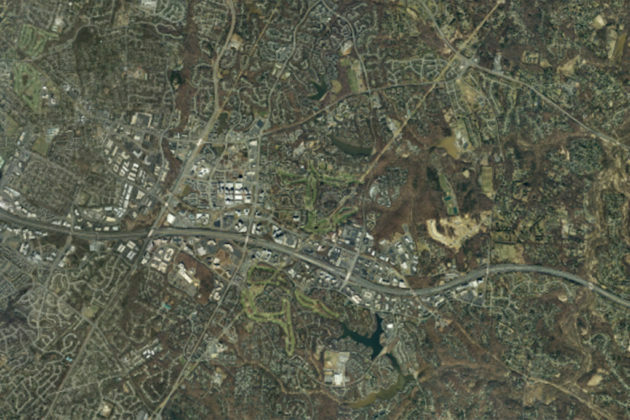 After the Reston Town Center starts showing up in aerial photography in 1990 (construction began in 1988) the development starts to shift west of the original area and more toward major transit routes. 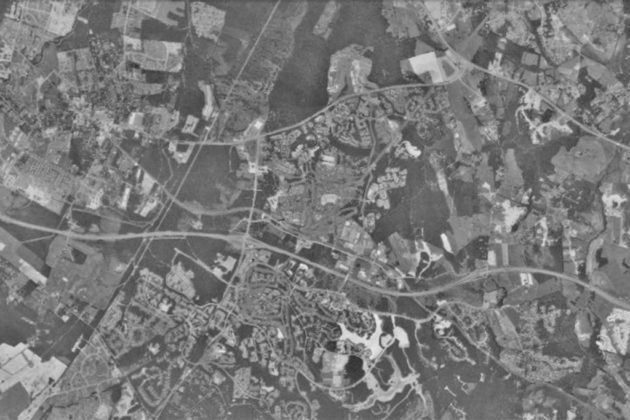 In the photography from 1990, construction also starts to bunch around the Dulles Toll Road in the Reston Station neighborhood. 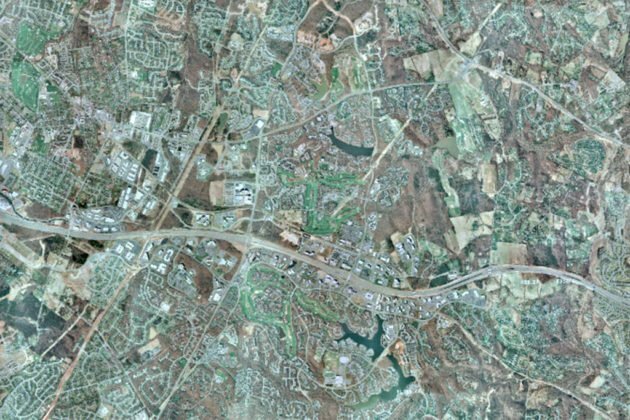 The Toll Road was built in 1982, and by the early 2000s, the urban centers of Reston shift away from the villages to the north and south and more towards the developments along the major highway. This density starts to ramp up in 2011 as the area builds up for the Silver Line’s opening in 2014. 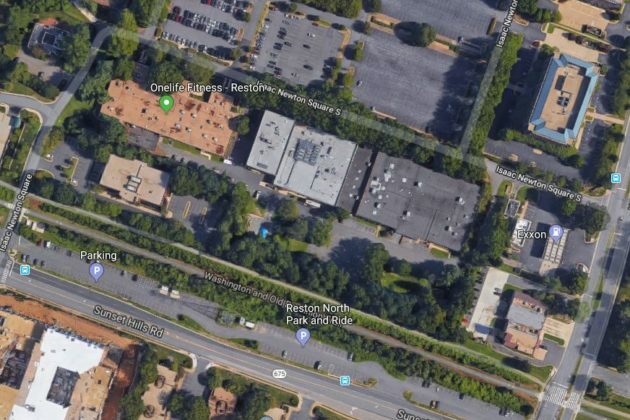 The density continuing to focus around the Silver Line is poised to continue as developers plan new mixed-use buildings near Woodland Park by the planned Herndon Silver Line Metro station. Drivers will have their Herndon-Monroe parking relocated to the new garage starting next week as work continues in preparation for the new Herndon Metro station. The existing parking garage will close next Monday (April 8) for a few months as it undergoes changes. Parking will get relocated to the first, second and third levels of the new garage, which is almost done with construction, according to Fairfax County. 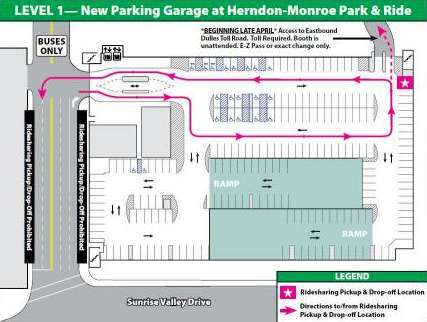 Ridesharing pickup and drop-off will also get moved to the first level of the new garage. 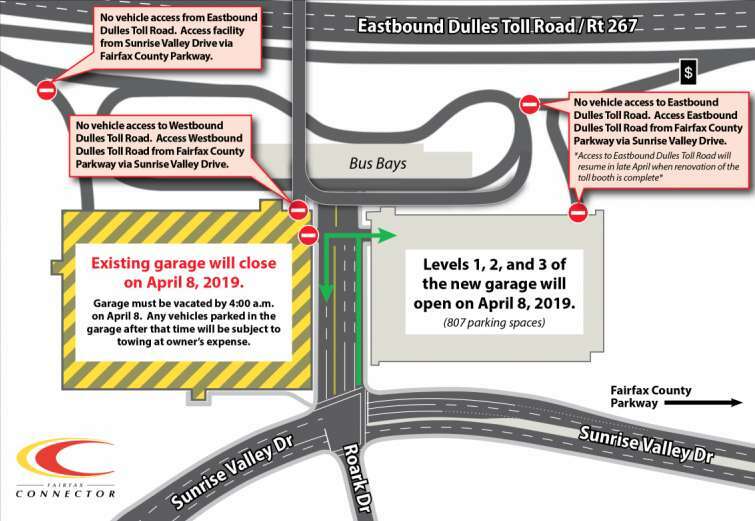 Access to eastbound Dulles Toll Road from the parking facility is scheduled to resume in late April after toll booth renovation is done. 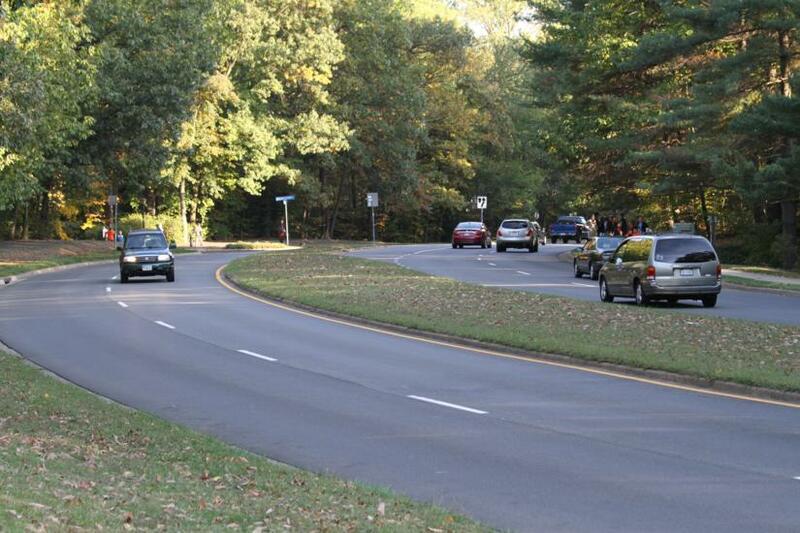 Until then, drivers will need to take a detour onto Sunrise Valley Drive via the Fairfax County Parkway. Snow plows are working to clear roadways this morning after a snowstorm began earlier this morning. 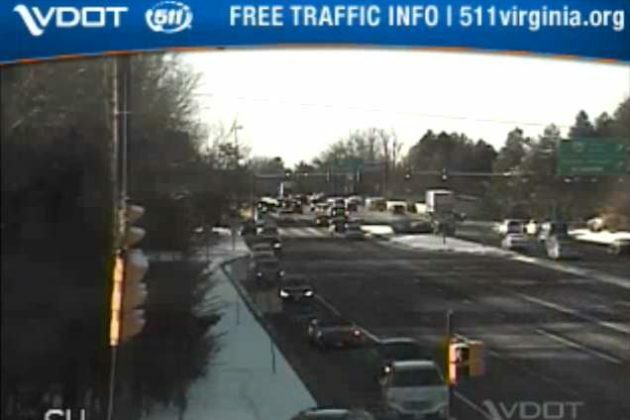 A traffic camera facing westbound at the snow-covered intersection of Reston Parkway and Sunset Hills Road shows more trucks with snow plows than cars this morning. 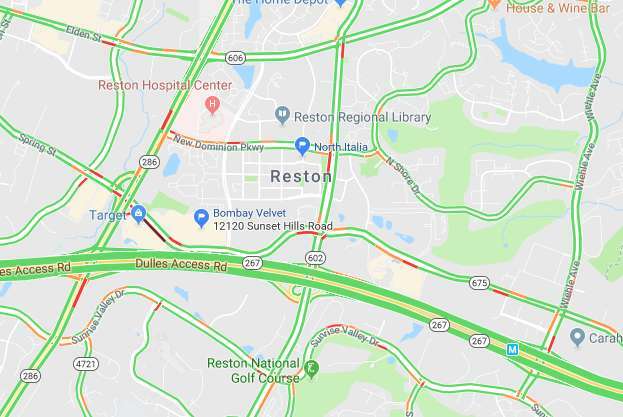 Still, drivers can expect some slow-moving traffic on the Dulles Toll Road and major roads in Reston and Herndon with spots of congestion near intersections. 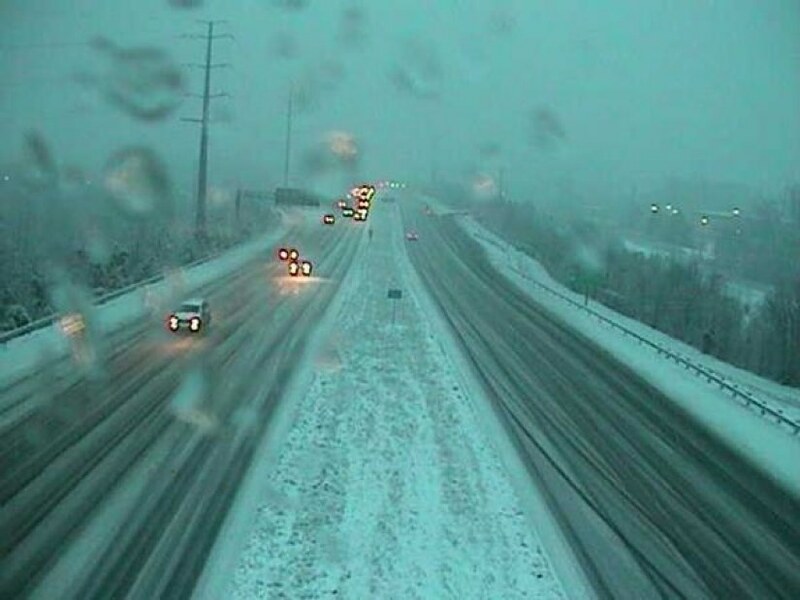 Fairfax County wants locals to stay off the roads, especially with low visibility near the Reston Parkway. The National Weather Service’s Winter Storm Warning is in effect until 7 p.m. 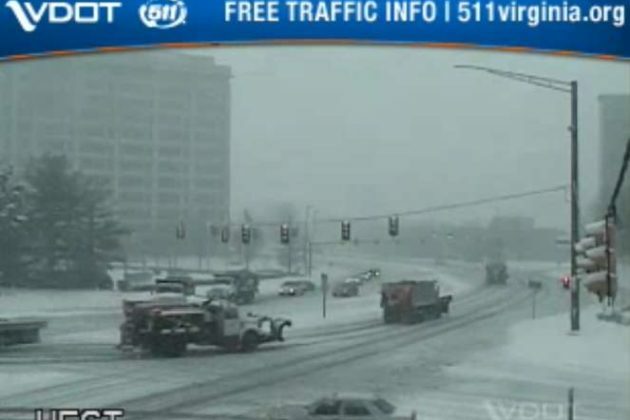 The Virginia Department of Transportation wants locals to stay off of the roads. “Pockets of heavier snow may limit visibility and stick to the pavement, and a mix of freezing rain may quickly make roads slick,” VDOT said in an update at 6 a.m.
(Updated at 9:35 p.m. on Feb. 21) Woofie’s, a pet care service that offers a mobile pet salon, pet sitting and dog walking, plans to open one of its two upcoming franchise locations in Reston. 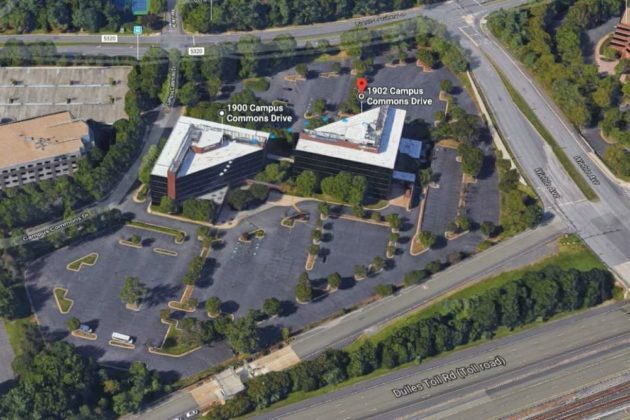 The Facebook page for the Reston location says it is “coming soon” to 1897 Preston White Drive. The spot is right off of the Dulles Toll Road and close to Lake Thoreau. 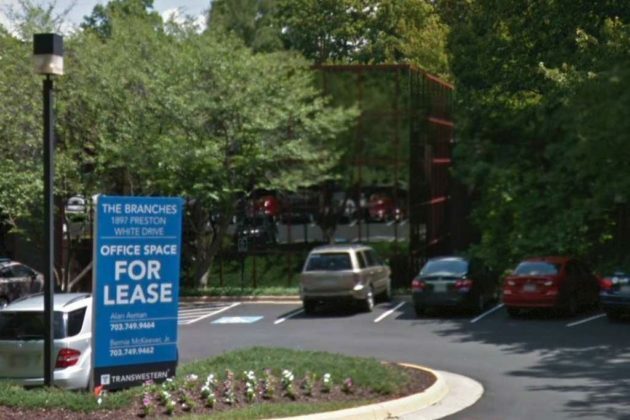 “We are shooting for an opening date in early April,” Renee Ventrice, the vice president of Marketing for Woofie’s Pet Ventures, told Reston Now. The second franchise location is set for Leesburg. 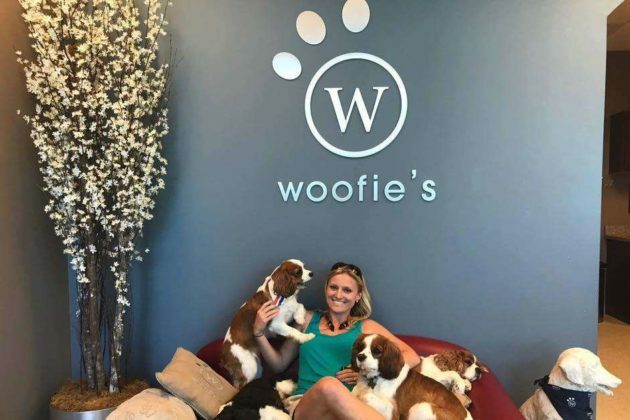 Established by pet owners in 2004, Woofie’s currently serves locals in Ashburn, Pomotac Station and Lansdowne with more than 70 pet sitters and walkers and seven mobile pet vans, according to its website. Updated at 4:55 p.m. — NWS canceled the Wind Advisory that was set to last until 6 p.m. 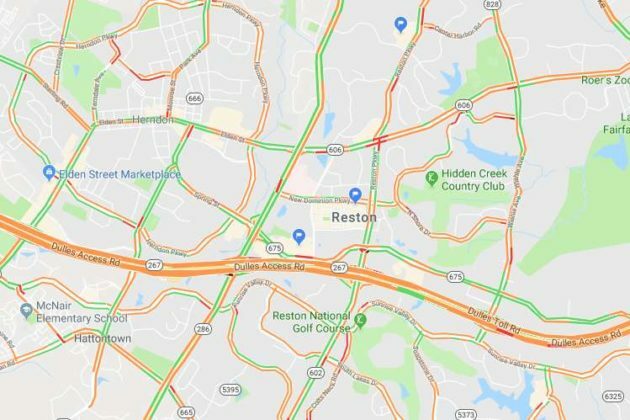 Earlier: After last night’s heavy congestion during rush hour, commuters are finding little to no traffic on major Reston roads this morning (Jan. 30). 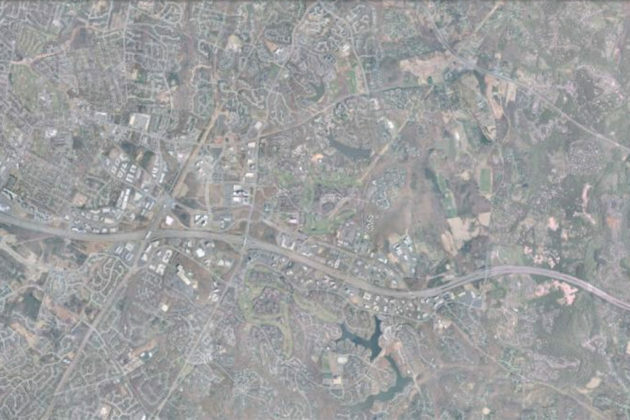 Traffic on the Dulles Toll Road is flowing freely, according to Google Maps. However, drivers should still give themselves extra travel time for possibly icy local roads. “Your commute will take longer today,” Fairfax County tweeted this morning, adding that crews worked overnight to treat roads and will continue treatment today if needed. Drivers are encouraged to reduce their speeds, use headlights and not brake quickly. Anybody stepping outside today should also bundle up. The National Weather Service issued a Wind Advisory until 6 p.m. tonight and a Wind Chill Advisory between 9 p.m. tonight and 10 a.m. tomorrow (Jan. 31). * WHAT…Very cold wind chills of 5 to 10 degrees below zero. * WHERE…Portions of central Maryland and northern Virginia including Washington DC and Baltimore MD. * WHEN…From 9 PM this evening to 10 AM EST Thursday. * ADDITIONAL DETAILS…The cold wind chills could result in hypothermia if precautions are not taken. A Wind Chill Advisory means that cold air and the wind will combine to create low wind chills. Frostbite and hypothermia can occur if precautions are not taken. Dress in layers, and wear a hat and gloves. Fairfax County Government offices are open today, however, employees have been granted unscheduled leave. Fairfax County public schools are closed today. 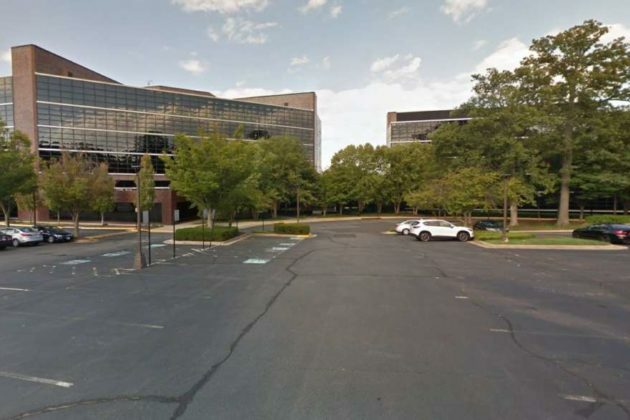 Reston Association offices will open three hours late. 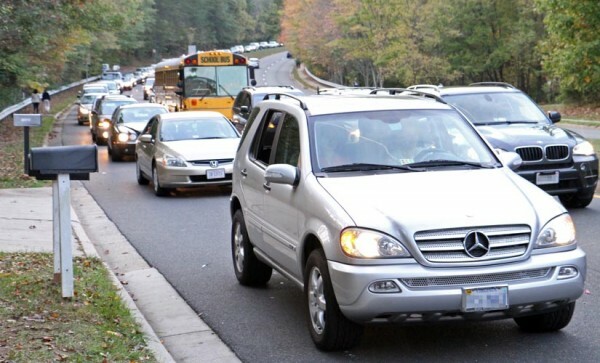 A meeting seeking public input on the Fairfax Connector has been canceled for tonight and will be rescheduled. 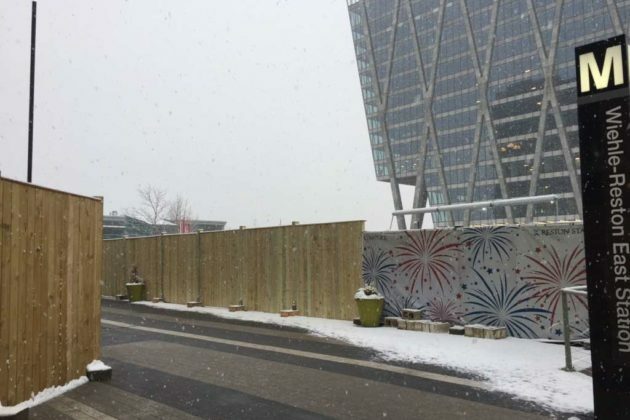 Locals have been busy snapping photos of the snow around Reston, including the following. 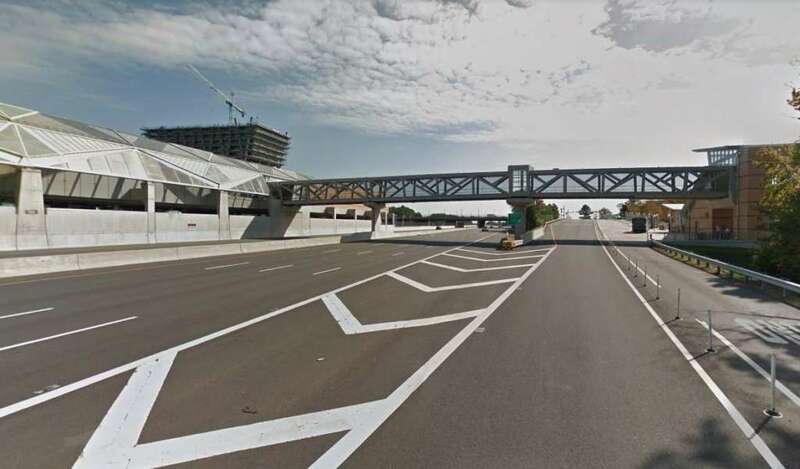 Construction work on the second phase of the Metrorail Silver Line project brings lane and ramp closures from Sunday (Jan. 13) until Saturday (Jan. 19). Eastbound also has a left lane closure 500 feet west of the Reston Pkwy overpass to 300 feet before the Wiehle Avenue overpass. This will occur from Wednesday until Friday from 9:30 a.m. to 3:30 p.m.
Also heading westbound is a triple left lane closure from Reston Pkwy to the west end of Herndon Station from 10 p.m. to 5 .m. from Tuesday until Thursday. Two left lane closures are also scheduled. One will stretch from 300 feet west of the Wiehle Avenue overpass to 400 feet of the Reston Pkwy overpass from 9:30 a.m. to 3:30 p.m. from Tuesday until Friday. The second one will be from 200 feet west of the Hunter Mill Road Bridge to the W&OD Trail from 9:30 a.m. to 3:30 p.m. from Monday until Thursday. Eastbound on Sunset Hills Road will have alternating right and left lane closures from 400 feet west of Town Center Pkwy to Bechtel Building Entrance. The civil work will take place from 9:30 a.m. to 3:30 p.m. from Monday until Thursday and from 9:30 a.m. to noon on Friday. Edmund Halley Drive will have a right shoulder closed from 9:30 a.m. to 3:30 p.m. from Monday until Thursday and from 9:30 a.m. to noon on Friday. Construction work on the second phase of the Metrorail Silver Line project brings lane and ramp closures from Sunday (Jan. 6) until Saturday (Jan. 12). 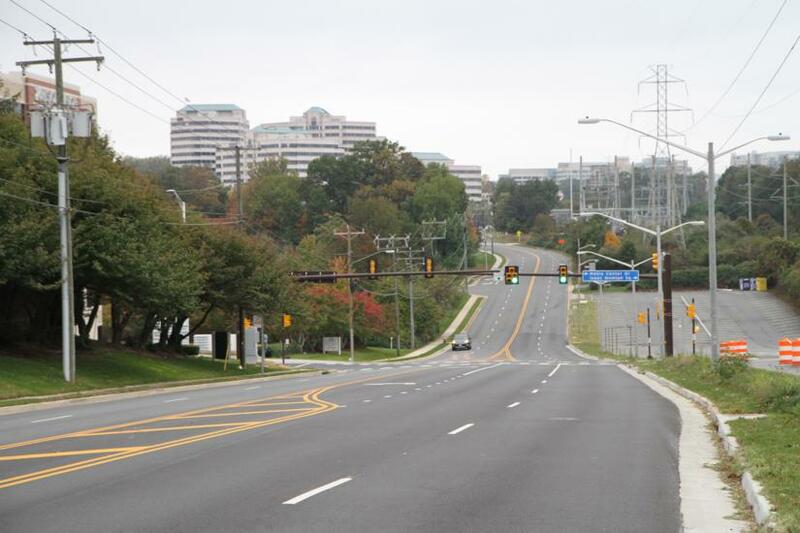 Drivers can also expect triple lane closures eastbound on the Dulles Toll Road from the west end of the Herndon Station to the east end of the Reston Station. This will take place from 10 p.m. on Wednesday until 5 a.m. on Thursday. Eastbound on Sunset Hills Road will have alternating right and left lane closures from 400 feet west of Town Center Pkwy to Bechtel Building Entrance. The civil work will take place from 9:30 a.m. to 3:30 p.m. from Monday to Thursday and from 9:30 a.m. to noon on Friday. Eastbound on Herndon Parkway from 1,000 feet east of Van Buren Street to 800 feet west of Exchange Place will have a right lane closed from 9:30 a.m. to 3:30 p.m. from Monday to Thursday and from 9:30 a.m. to noon on Friday. Construction work on the second phase of the Metrorail Silver Line project brings lane and ramp closures from Monday (Dec. 31) until Saturday (Jan. 5). Wednesday to Friday: 10 a.m. to 3:30 p.m., 9 p.m. to 5 a.m.
Wednesday to Friday: 9:30 a.m. to 3 p.m., 8 p.m. to 5 a.m.
Also heading westbound is a triple left lane closure from the Van Buren Street overpass to the Route 28 overpass from 10 p.m. on Friday to 5 a.m. on Saturday. Eastbound on Sunset Hills Road will have alternating right and left lane closures from 400 feet west of Town Center Pkwy to Bechtel Building Entrance. The civil work will take place from 9:30 a.m. to 3:30 p.m. on Thursday and from 9: 30 a.m. to noon on Friday. Eastbound on Herndon Parkway from 1,000 feet east of Van Buren Street to 800 feet west of Exchange Place will have a right lane closed from 9:30 a.m. to 3:30 p.m. on Thursday and from 9:30 a.m. to noon on Friday. At its meeting tonight (Dec. 17), the Reston Planning and Zoning Committee will hear presentations on two projects. 1900-1902 Campus Commons LLC’s proposed development, known as Campus Commons, would add an office building and two residential buildings with ground-floor retail space at 1900 and 1902 Campus Commons Drive. 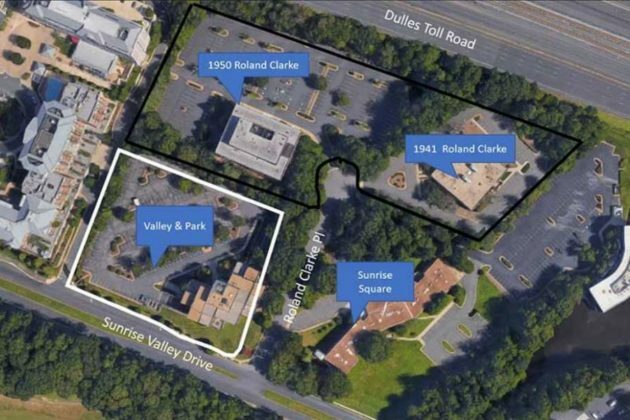 The plan retains the two existing buildings at the site on the south side of the Dulles Toll Road and east side of Wiehle Avenue. “Campus Commons will bolster a pedestrian-focused environment integrated with a system of public urban park spaces to achieve the transit-oriented design goals of the Comprehensive Plan,” the agenda for tonight’s meeting says. APA Properties No. 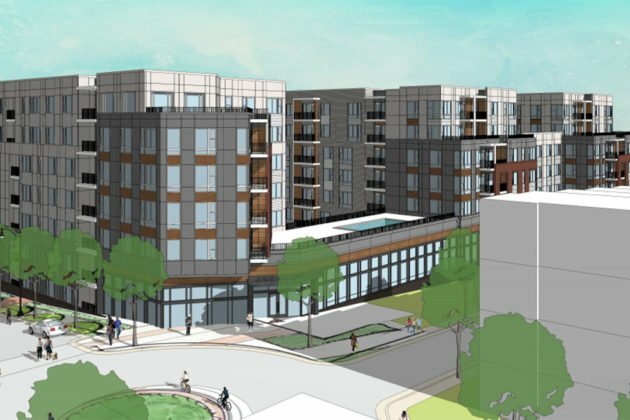 6, L.P. and MRP Realty plan to present a redevelopment concept for Isaac Newton Square. 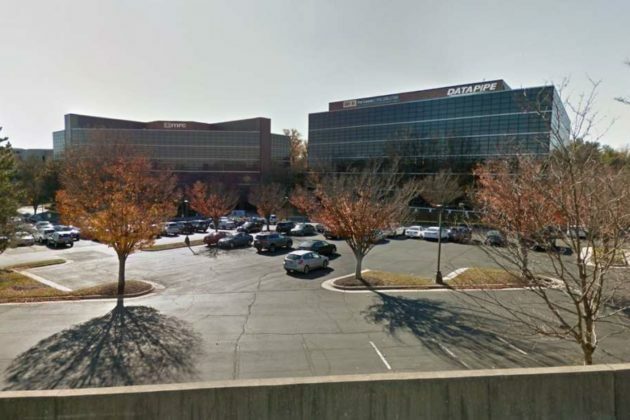 The proposal would convert the office buildings into a mixed-use project, changing the spot into a mostly residential area with a few commercial spaces. The project would include several development blocks and approximately eight acres of publicly-accessible open space, which would include a large neighborhood green that could be used for public events and athletic purposes. The number of dwelling units and square footage are unknown at the moment, according to the document. 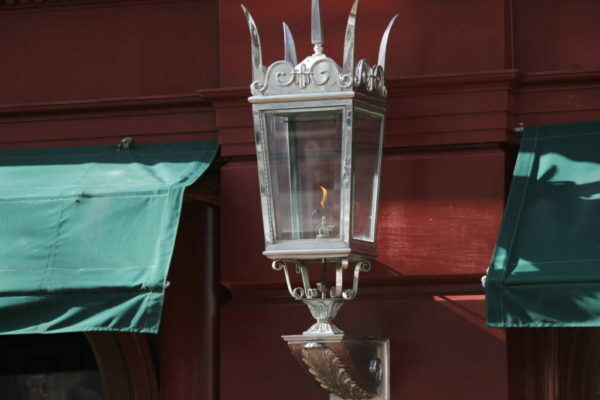 Public hearing dates have not yet been scheduled for the projects. 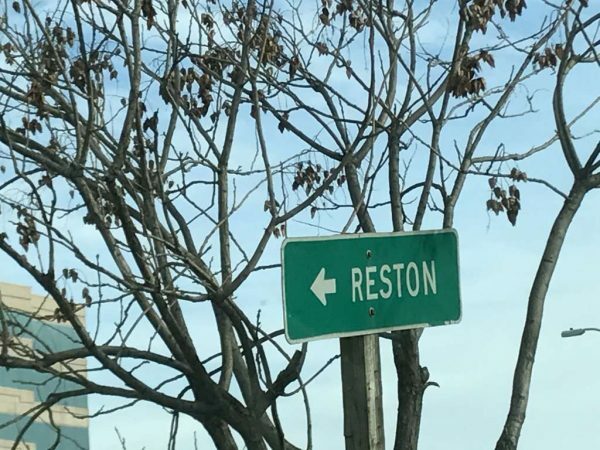 Tonight’s Reston P&Z Committee meeting will begin at 7:30 p.m. at the North County Government Center. Updated at 9:52 a.m. — United Airlines said that it does not receive a special jet fuel tax break. Del. Elizabeth Guzman unveiled a bill yesterday that would lower the tolls on Dulles Toll Road, one month after the toll hikes were approved for next year. The bill would offset some of the upcoming toll increases by ending what Guzman calls United Airlines’ “jet fuel tax exemption” and directing that roughly $4 million per year toward the Silver Line project, which is currently funded largely by tolls. That revenue could cancel almost 9 percent of the scheduled 2019 toll increase, according to a press release from UNITE HERE Local 23. “United Airlines does not receive a special tax break and pays the same jet fuel tax as all other airlines that serve airports in the Commonwealth,” Kimberly Gibbs, a spokeswoman for United Airlines, said. In Virginia, larger airlines like United Airlines pay less per gallon in taxes on most of the jet fuel they use, the press release says. The Metropolitan Washington Airports Authority Board of Directors voted Nov. 14 to increase rates on the Dulles Toll Road for the first time since 2014 to fund the Silver Line extension project and improvements on the Dulles Toll Road, according to the MWAA. Starting in January, the hike will raise the toll from $2.50 to $3.25 at the main toll plaza and from $1 to $1.50 on ramps. The bill responds to community concerns about the increasing tolls, which are expected to rise to more than $11 by 2043 without alternative funding, the press release said. Dels. Kaye Kory and Lee Carter, Virginia AFL-CIO, UNITE HERE Local 23 and CASA in Action, joined Guzman by the windows outside the United Airlines ticketing counters on Wednesday (Dec. 12) at 5 p.m. for the announcement about the bill. 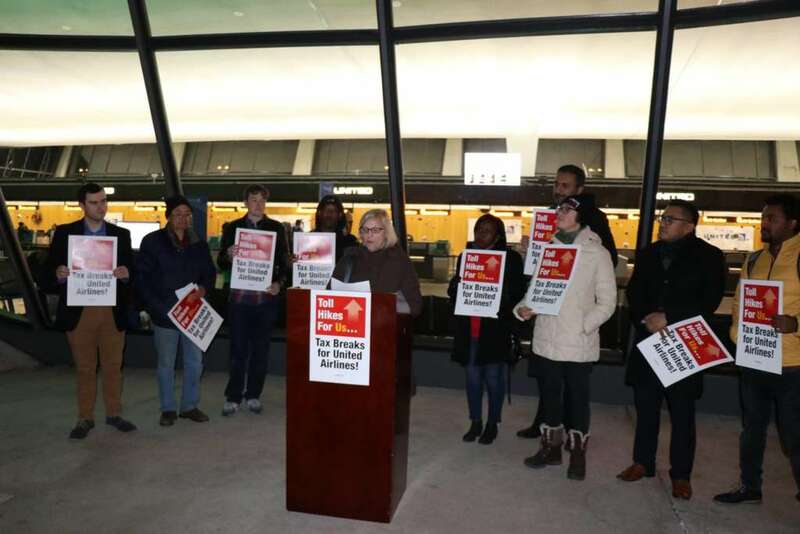 Supporters of the bill argue that the Silver Line project will redirect more of the consumer air traffic market to Dulles International Airport, bringing an additional $66 million to United Airlines with 1 percent more of the regional passenger airline market. Similar efforts in New Jersey are also underway. In September, the New Jersey Senate passed similar legislation to end United’s jet fuel tax break there to fund aviation-related transit projects. “Commuters and every other business along the Dulles Corridor are already paying their fair share for the Silver Line. United Airlines should too,” Doris Crouse-Mays, president of the Virginia AFL-CIO, said. The closures started on Sunday (Dec. 9) and are scheduled to last until Saturday (Dec. 15), according to a post from the Dulles Corridor Metrorail Project. Drivers heading eastbound on the Dulles Toll Road can expect left lane closure with stops every 20 minutes from the Herndon-Monroe Park and Ride to the Reston Parkway overpass. This will take place from 10 p.m. until 6 a.m. on Tuesday. Meanwhile, westbound on the Dulles Toll Road has a triple left lane closure with 20-minute stoppages from the Wiehle Avenue Overpass to West of the Reston Parkway overpass. This is scheduled from 10 p.m. to 6 a.m. on Wednesday.